My brother calls this my Neopolitan Ice Cream skirt. I call it my Birthday Tutu! I've worn it for my birthday before (see this old-as-the-hills post). It's just so perfectly pinkly party-y! I wore it with my grandmother's crinoline underneath. Can you believe she used to wear it under her poodle skirts in the 50s?! I love it so much it's not even funny. The feather headpiece was a birthday gift a few years ago from one of my very best friends. I love it so much and have worn it on many birthdays because it is just so birthday-y! I wore some vintage costume jewelry earrings, and my polka-dot tights too. A birthday only comes once a year, so it definitely requires some party clothes! Don't you agree? Check out PART TWO here, including my green-ombre cake with pink frosting! Happy (late! :( birthday, lovely cousin! So glad it was special with family. Love your napolitan ice cream birthday tutu!!! So gorgeous and feminine! :) Happy Late Birthday dear!!!! God bless you! I love your birthday skirt!! 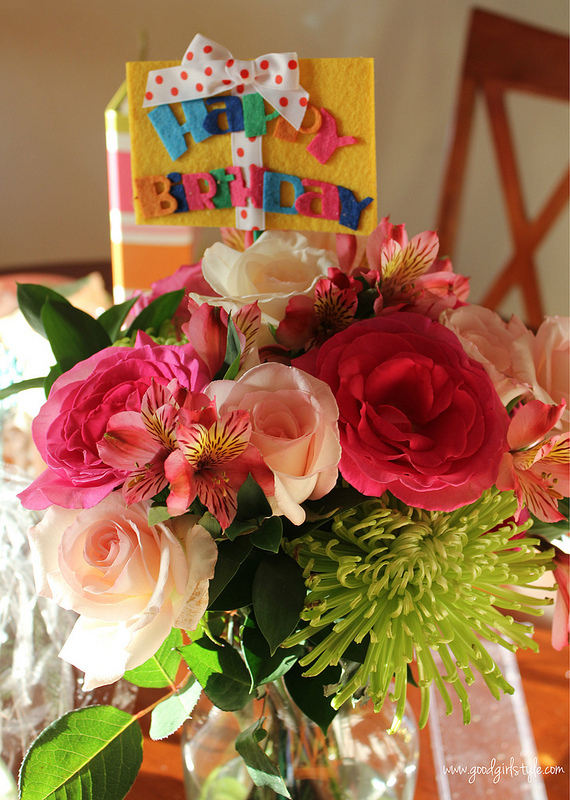 Also, the little felted 'happy birthday' present in the flowers is super adorable. It is giving me all sorts of (good, hopefully) crafting ideas!